Hetas wood burning stove installers covering Somerset and Devon. Looking for wood burning stove installers? Glowing Stoves supply and fit most types of woodburner including multi fuel stoves. This heavy cast iron log burning stove went in like a dream. Supplied by the customer, Glowing Stoves carried out the fitting. Because it is below 5kw, however, it does not require an air vent. This woodburner installation is in Tiverton, Devon. 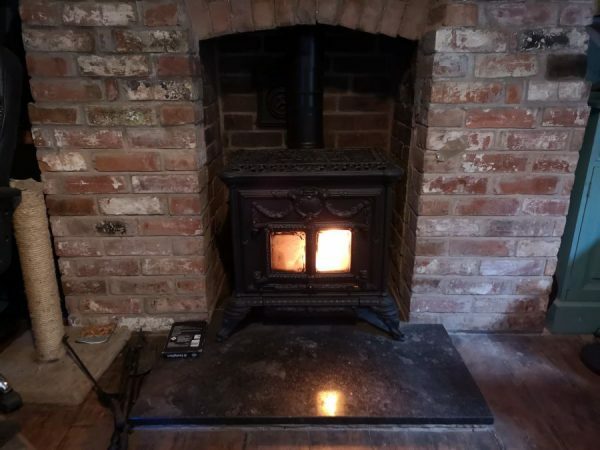 Cheapest wood burning stove installers in Somerset and Devon. We beat all other installers despite offering quality stove installations. Furthermore, if you already have a quote, call us and we will beat it. We are Hetas registered and fully insured. In addition, we are prompt and reliable. Call us and we will book an appointment for a free survey.